Mmm butternut squash. So yummy. So versatile. The other night my mom and I made a mac and cheese with squash instead of cheese. It was pretty good! 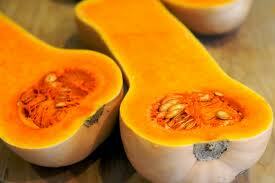 But we were left with roasted squash that kept getting pushed to the back of the fridge. No way! I said. We are NOT wasting that squash! I also happened to have some cauliflower that needed to get used up. And so, squalimash was born! That’s roasted squash and steamed cauliflower mashed together! Add a little s +p (and butter if you like although there’s really no need) and you’re done! Flavourful, healthy, colourful, textured and a great alternative to plain old mashed spuds. Try it! And enjoy telling your family they’re having squalimash for dinner! This entry was posted on October 26, 2011 by katelivingfull in Savoury Recipes.